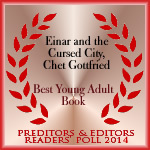 Winner in the Preditors & Editors Readers' Poll for Best Young Adult Novel! Sixteen-year-old Einar enters Jorghaven for dueling and desserts, but a curse has changed everyone except Barbara Bloodbath, who needs his help to free the city! A young adult fantasy suitable for readers of all ages.